Found 10 file extension associations related to RollerCoaster Tycoon and 10 file formats developed specifically for use with RollerCoaster Tycoon. 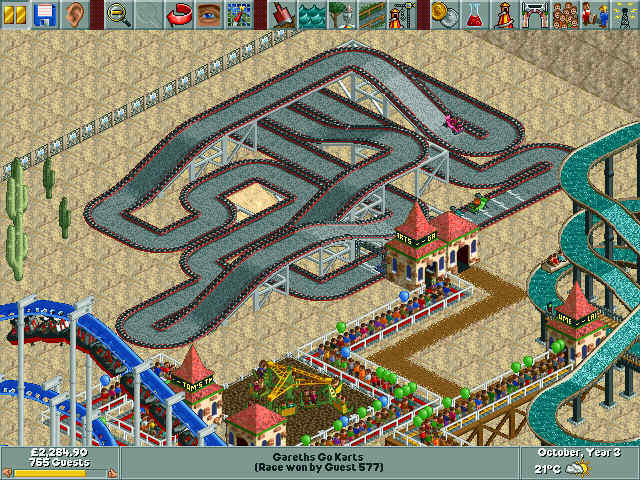 RollerCoaster Tycoon is a simulation strategy computer game that simulates theme park management. Developed by MicroProse and Chris Sawyer and published by Hasbro Interactive, the game was released in 1999 for Windows and was later ported to the Xbox game console. A special edition called Roller Coaster Tycoon Deluxe was also released which contained the original game and the two expansion packs. It is the first game in the RollerCoaster Tycoon series and was followed by RollerCoaster Tycoon 2 and RollerCoaster Tycoon 3, but Roller Coaster Tycoon 3 was developed without the old owner, Chris Sawyer. If you need more information please contact the developers of RollerCoaster Tycoon (Atari, Inc.), or check out their product website.